Utagawa Kunisada (1786-1865) Thirty-six Selected Flowers: Potted Violets, 1862. Oban. This is one of the famous series from late in Kunisada’s career. These brilliant late works by artists such as Kunisada, shimmer with life, enthusiasm and confidence. Kunisada was an old man of 76 and at the peak of his design skills… his studio perhaps was over productive but the brilliance and the freshness of his work bears comparison in many ways with Warhol’s Factory of the 1960’s and its relation to New York. The print (Thirty-six Selected Flowers: Potted Violets ("Tosei mitate sanjuroku kasen")) is a mitate, a puzzle picture alike to a western cryptic crossword. The mitate became popular during the years of the Tenpo Reforms whereby strict censorship restricted production and artists were obliged to disguise their subject matter. In this case, the print series looks for matches between the characteristics of a flower and the story or character of an actor or kabuki play. Here, Kunisada pictures the kabuki actor, Kawarazaki Gonjuro I as the popular hero Jiraiya. In the legend, Jiraiya is a ninja who uses shapeshifting magic to transform himself into a gigantic toad. As the heir of a powerful clan in Kyushu of the same name, Jiraiya fell in love with Tsunade, a beautiful young maiden who had mastered slug magic. His arch-enemy was his one-time follower Yashagoro, later known as Orochimaru, a master of serpent magic. The story has become the subject of many prints, novels, dramas and more recently films. In Naruto, a popular manga and anime television series, Jiraiya appears as a ninja with the ability to summon giant toads. There is an entertaining 1920 film version available on Youtube (toad magic appears about 12 minutes into the film), and the synopsis of the entire play is available at Kabuki21. 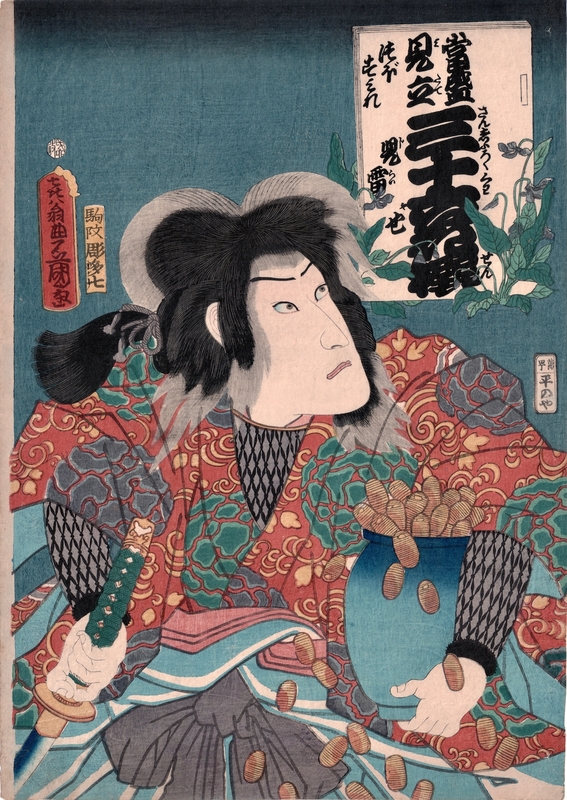 Kunisada shows Jiraiya grasping a pot of gold coins, symbol of the wealth he hopes to regain… a visual equivalent to the potted flowers in the cartouche above. This is a superb Kunisada, the impression is very fine and fresh, the colour superb and the condition very good indeed. Margin to the left edge and no blemishes. Unbacked. Blockcutter: Ota Komakichi (Hori Koma, Hori Tashichi).